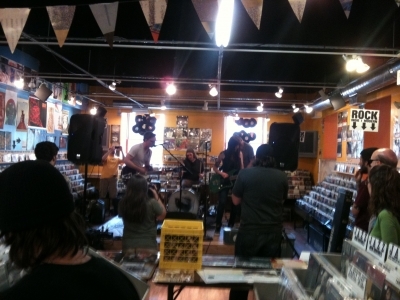 Record Store Day 2012 is now in the books and after now its 5th it's only getting stronger. It began early this morning outside independent record stores across the area with lines of music lovers waiting for stores to open so they could get their hands on the exclusive and limited releases pressed just for today. Of course every shop is independent so they can pick and choose which releases they are going to carry and decide how much stock they think they should carry. It either makes the game more frustrating or just adds to the fun which is the nature of record stores. By early afternoon though anything popular was gone and the pickings were slim on the RSD merch, doesn't mean that you couldn't dig into the rest of stacks. Most stores had something going on today, whether it be a special sale on other merch, in store appearances, or performances. I ventured out in the northern suburbs to check out what was happening at a couple of stores. First I headed into North Wales and The Vinyl Closet. This is a new small, local store on Main Street. Great selection of 12” classic rock and rock plus a $.75 back room if you want to dig around. Music in the shop comes through the house record player up front, I'm sure you can ask to hear an LP before you buy. Next I headed over to Doylestown to Siren Records. This is a terrific, larger independent store with new and used cd's and LP's; sections for Classic Rock, 80's, Indie Rock, etc. all curated very nicely. What was also nice today was that Siren was hosting performances by Philly's own Creepoid and Cheers Elephant. 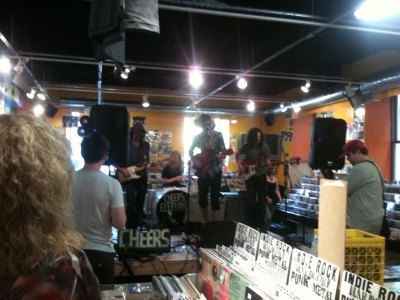 Both bands put on terrific sets inside the store as patrons were hanging out watching the show or walking around sorting through records. Makes you wish that every time you're hanging out in the record shop a band is in the front window blasting away. Record Store Day was founded in 2007 "as a celebration of the unique culture surrounding over 700 independently owned record stores in the USA, and hundreds of similar stores internationally... This is the one day that all of the independently owned record stores come together with artists to celebrate the art of music." It is also supposed to bring awareness to the existence of the independent record store and the independent musician. We can't just go to the stores one day a year, we have to keep going back. Listen to iradiophilly's Y-Not Radio for Indie Rock on iradiophilly. You can also hear both Creepoid and Cheers Elephant playing on Y-Not. 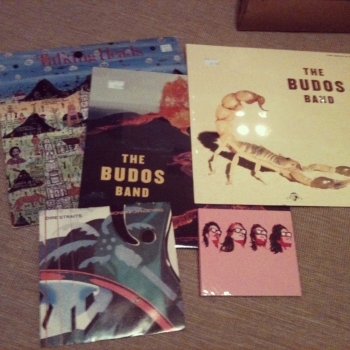 Record Store Day take: Talking Heads "Little Creatures", The Budos Band, The Budos Band II, Dire Straits "Money For Nothing" 45, Cheers Elephant "Like Wind Blows Fire"